This month's favorite things are all about inspiration. After a long winter, too much time spent indoors, and not enough "me" time, I was really in a funk. I've been looking for anything to move my mindset a little more in the positive direction. The following are some things that have been helpful to me in different ways ... some small and some truly transformational. 1) "A Complaint Free World"
This book has been a godsend for me. Originally published in 2007, A Complaint Free World is not "new", but its message is just as important today as ever. I remember a former colleague mentioning that she'd seen author Will Bowen on the Oprah show. He'd spoken of a challenge, as outlined in his book, to go "complaint-free" for 21 days. To assist with the challenge, there were purple bracelets you could purchase. My colleague brought in a bunch of bracelets for the faculty, but at the time I didn't really understand the concept or participate. Then, just a few months ago, the hosts of the Happy Hour Podcast (on which I was a guest), mentioned this book to me. This time, I was ready for it. The gist is that each time a person complains, criticizes, or gossips, they would need to move their purple bracelet from one wrist to the next ... a reminder that they've "slipped" up and to rethink their words. The goal to go 21 days without complaining and thus without moving the bracelet, is much, much more difficult than you could imagine. In fact, the author says it usually takes 4-8 months for most people to go a full 21 days. I did not purchase a purple bracelet, but I do wear a hair tie around my wrist. When I find myself doing things like complaining, griping, or yelling at my children about their behavior, I move my hair tie. In fact, I actually snap it against my wrist ... not to elicit pain or punishment, but as a physical reminder, a sensation that makes my brain remember to re-word my thoughts and/or to handle situations differently. I am deeply aware that my children's little ears hear my words and that they are at a most impressionable age. The insights in this book are profound. There are tons of anecdotal stories. I've highlighted many pages and many quotes that help to serve as reminders and inspiration to be less negative and more optimistic and positive. Complaining less ... and being aware of my words and actions ... really does improve my mindset. It makes me happier. It helps me enjoy my days. It forces me to not sweat the small stuff and to look at the bigger picture of life. I can't recommend this book enough if you're looking for spiritual growth and/or incentive to improve your attitude. I actually also downloaded the audible book onto my iPhone so I can listen to portions of it when I'm driving or out walking. She Reads Truth is an online devotional geared towards women. It is a subscription email service, but there is also an app available for download and a book written by the founders. The website encourages and gives women an easy way to be in the Word of God every day. Not only that, but it’s a community of women reading through the Word of God TOGETHER daily. After reading the scripture and devotional passages, women can comment and reflect below. It's interesting and insightful to read others' understandings of the scripture and how it pertains to their lives. But if one wishes to look through scripture other than the daily reading, there are a bunch of other reading plans available for personal daily devotions. The site is also beautiful and has "pinnable" Bible verses and quotes that you could save as photos. I have a Pinterest board just for such types of spiritual and faith-based messages. 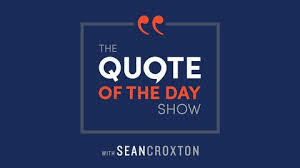 Sean Croxton, creator of The Quote of the Day Show, is nothing short of incredible. Sean started out with a YouTube channel in which he shared videos about health. Then he moved to podcasting. On his first podcast, Underground Wellness Radio, he interviewed authors and experts in the alternative health space. Over the past few years, Sean has created a new movement in the world of personal development and the science of mind. His goal is to teach people how to use their minds to give and get everything they want in life. His following is large. In this new podcast (QOD), every day, Monday through Friday, a quote from a famous or not-so-famous inspirational speaker is featured ... Tony Robbins, Les Brown, Jack Canfield, Wayne Dyer, and Bob Proctor are just a few. After Sean reads the quote, he plays a clip from the motivational speaker's public speech or talk that gives context to the quote. Sean sometimes provides his insights prior to playing the clip, and other times, he lets the clip speak for itself. I've found listening to the QOD is a really nice way to start my day. It takes only a few minutes ... in fact the quotes and clips are no longer than 12 minutes and most are only around 5. I've gained some powerful insights from some and motivation from others. The quotes and advice range from spiritual to inspirational to financial. You can listen to the podcast through any podcast app OR directly on the show's website. Instagram is known primarily for being a social media photo album. We all like to look at and share beautiful photos, and IG is great for that. But it is also a great place to find quotes and quick pieces of inspirational advice. Lately, I've been seeking out Instagrammers and boards that really lift my spirits. The following are some Instagram pages I follow because they provide affirmations, meaningful quotes, or just plain make me happy. @happsters -- "Happy Inspiration: Follow for happy quotes + cute puppies on Fridays"
@happywholeliving -- "Affirmations + Good Vibes"
@thegoodquote -- "Positive and Motivational Quotes"
P.S. ... if you haven't joined Instagram yet, you should. You don't even have to post a photo, and you can make your account private. But it might be worth joining just to follow boards such as these. 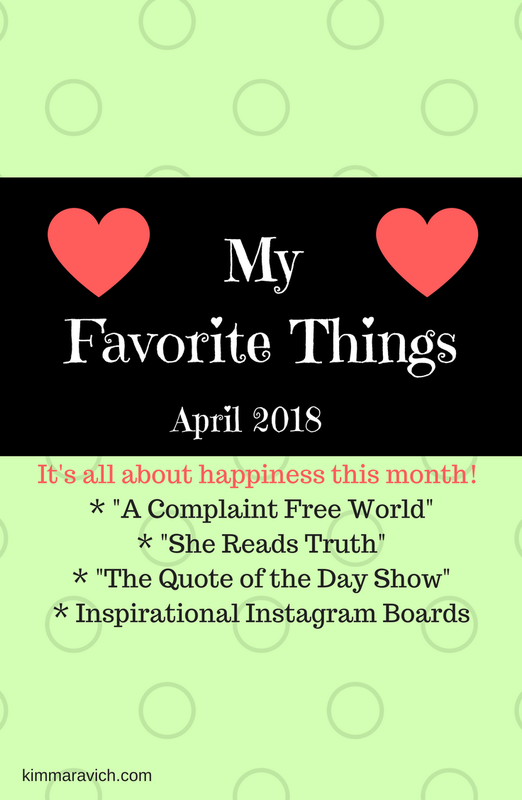 Thanks for reading April's list of "My Favorite Things." I hope you find something above that may help you feel little happier, too!